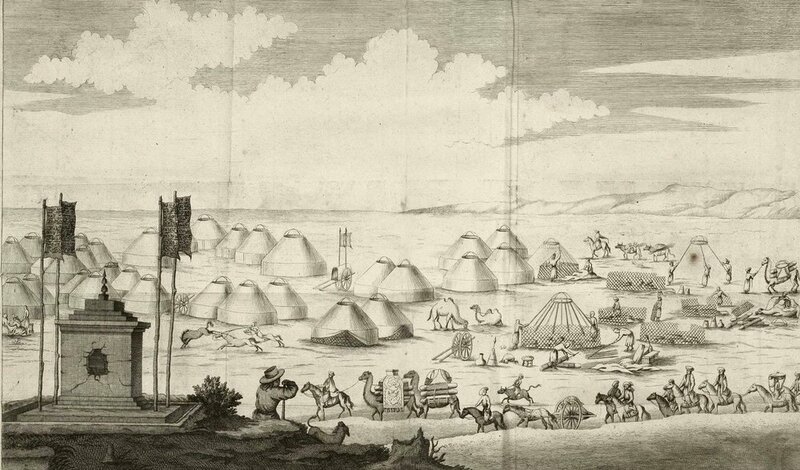 A Turkmen camp, illustrated by P.S Pallas in 1776. Courtesy of my friend, John Taylor. In the front see a wedding procession complete with all of the trappings that collectors cannot get enough of! Per John, "... including kedjebe litter with the bride ensconced; the leading camel appears to be adorned with a fantasy asmalyk. Of note are the ok-bash containg Yurt-struts,on the 2nd camel and lying on the ground." I have often thought that some "gul" patterns represent encampments, most especially in the second etching. The third etching from the same period sketched by Emile Bayard, mid-19th century shows the elaborate headdress, similar to the one from our own collection, below.